This three-level model train layout uses a wood space frame construction with 6 legs, which fold for storage. 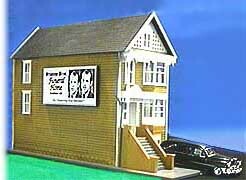 Overall size is 7 feet by 10 feet with a 24" by 30" removable extension section which holds the Lionel Hobby Shop. The tip of the mountain is 65" from the floor. The wood/plywood space frame construction makes for a very good strength-to-weight ratio - important for a portable layout. The legs fold down, the front-leaf drops and the unit can be flipped 90 degrees so that it rolls on casters mounted behind the rigid scenic backdrop. The layout also has a removable top layer (the mountain area); the hobby shop extension also detaches for storage. 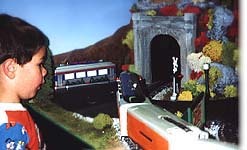 The mountain and tunnel entrances were created using carved foamboard stock and sprayed-on urethane foam - for light weight. Streets and sidewalks were made using .187" Gatorplast - a foam-core plastic sheet with .015" solid styrene facias - much lighter and less fragile than Hydrocal plaster. All tracks are laid over rubber roadbed to dampen noise. All ballast is made from ground rubber (also to dampen noise) and is glued to the roadbed. A black skirt trims the front and sides. It was made by my daughter-in-law and is Velcro-ed in place. All buildings are lit with 12 volt bulbs which are connected to electrical busses on each level and run to the accessory terminal of the MTH Z-4000 transformer for power. Other transformers include an MTH Z-750, Z-500, several small Lionel AC transformers and a DC powerpak for the HO set. Construction photos can be found here. This O-scale train layout project was completed on August 26, 2000. Minor changes and improvements have been made since then - a few every year. The setting for this level is late 1939 Philadelphia. The 1940 model-year automobiles are already out but a billboard still advertises the 1939 Plymouth. The Milwaukee Road streamlined Hiawatha passenger train runs as a guest on Pennsylvania Railroad tracks. (It alternates with the massive PRR T1 steam loco which pulls a consist of Pennsy Tuscan passenger cars.) The PTC (Philadelphia Transportation Company) trolley is a model of the double-ended Brill trolleys used in Philadelphia during the period. The #11 is a real Philadelphia route which did run in a subway tunnel on part of its route. Passengers can cross from the PRR line to the PTC line using the passenger overpass. The owner's Packard is in the parking lot of the McNicholas Family Pub which is receiving a delivery of a truckload of Guinness beer. (Such an establishment - a speakeasy - actually existed at 16th and Ridge Avenue in the 1920s. And the owner drove a Packard.) The pub has a lighted neon 'Open' sign. The gray stone walls in the background are Pennsylvania Railroad dressed block, a familiar sight in Philadelphia. The Philly Newsstand is typical of the period and location; across the street a Public Service bus waits to take passengers to the New Jersey shore. The covered trolley platform is similar to the kind used for suburban locations in the 1930s and '40s. The Frankford Junction switch tower has correct Pennsylvania Railroad signage and is painted in the Pennsy color scheme. My dad worked out of Frankford Junction as a freight conductor for many years. My grandson was three years-old when this layout was built. The lower level was close to eye level for him; therefore, I added lots of detail and some operating accessories on the this level to amuse and entertain him. Every time the train goes by, crossing lights flash, bells ring and a gateman jumps out of his yellow shack to wave his red lantern. There is a flagpole in the park with an animated 'waving' stars 'n stripes. Press the green button on the right side of Union Station and boarding announcements will be heard. A animated working pumping station pushes bubbling 'oil' through a clear, lighted vertical pipe. In the rear of the lower level is something from the fifties - the Mayfair Diner with some hot rods and customs (1932 Fords, '49 'James Dean' Mercuries, etc.) parked in front. The real Mayfair Diner is on Frankford Avenue in Northeast Philadelphia; it opened in 1932 and is still in operation. The diner has an animated neon sign with a 'buzzy' letter 'E'. Nevertheless, he still enjoys seeing and operating the trains. The setting for this level is late 1958 in the Philadelphia area. At the Edsel dealer, they're still trying to get rid of the '58 models. Some 1959 models of other makes are already on the street, including a 1959 Ford retractable hardtop. The dealership also includes a used car lot filled with low-mileage Edsels for sale. Next to the used car lot is Discovery Plastics - an Oregon company which I owned from 1978 to 1989. The building is a replica of the first Discovery Plastics location - a small storefront in downtown Corvallis. Discovery's 1955 Hyster forklift, carrying 4x8 sheets of Plexiglas is near the side of the building. In the park in front of Discovery, there's an antique car show - featuring old cars from the 1920s and before. Next to the park is Our Lady of O-Gauge Catholic Church. Pope John XXIII is paying a visit in his Papal Mercedes, greeting two nuns. Across the tracks from the church is the Lionel Hobby Shop. There are 3 train layouts in the store windows - and - the little trains actually run! Behind the church is the A&W Root beer stand. Across the tracks is the Rohm & Haas Bristol Plant, where they manufactured Plexiglas. Drums and 4x8 sheets of Plexiglas are found in the area near the Plastics Lab (where I worked for 5 years). The top of the tall brick building (R&H Pelletizing Cooling Tower) is an bright animated neon sign for the Patriot Flag Company. Next to the R&H Plant is a tunnel leading to the Pennsylvania Turnpike. Next to the tunnel is a group of buildings - the Tasty Baking Company (makers of Tastykakes - the most popular snack treats in Philadelphia), Plant #2 of Discovery Plastics (if your eyesight's good you can see workers inside assembling acrylic displays), and Howell Machine Works - "Precision Lathe Work Our Specialty." 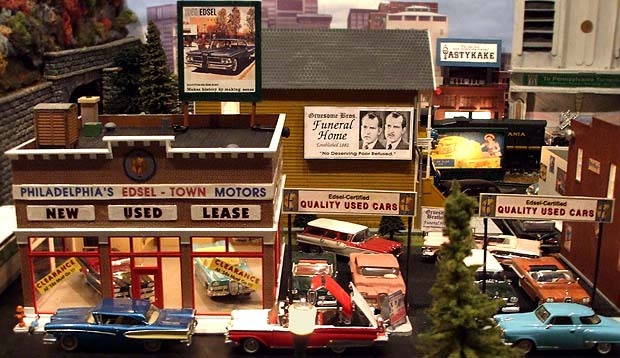 Also on the layout is the Gruesome Brothers Funeral Home. Their slogan 'No Deserving Poor Refused' was the slogan of Oliver H. Bair Co., a funeral director who had advertising placards on almost every subway car, trolley and bus in Philadelphia. The brothers look remarkably like Richard Nixon who, I always thought, looked like a funeral director. There is a black 1950 Cadillac hearse in the driveway - in 1950s Philadelphia, almost all hearses were black. Next to the funeral home (and across from the A&W stand) is a White Castle, home to the greasiest (but tasty) burgers in the universe. There were several White Castles in Philly. On the middle level, a big Pennsylvania Railroad GG1 electric locomotive, in a Tuscan-red color with five gold stripes (Williams O-scale - approx. 24 inches long), pulls a set of five silver 17.5" long scale passenger cars. There are real scale-model passengers in the seats of the cars. The Raymond Loewy-styled GG1 could develop up to 8,000 horsepower, could top 100 mph and weighed 460,000 pounds. These massive GG1s were in service from 1935 to 1983 and were a familiar sight in Philadelphia, thundering down the Main Line of the Pennsylvania Railroad. The GG1s were electric, pulling 11,000 volts from overhead wires. The special Tuscan loco combined with silver aluminum cars means that this train is the Congressional Limited - a crack express train which ran between Philadelphia and Washington, D.C. Sometimes, a silver Pennsylvania Aerotrain diesel set is substituted for the Congressional set on this loop. The Aerotrain has its own unique story, which is related here. A Philadelphia trolley car travels a loop through the city on the middle level. This particular trolley is a St. Louis Car Company-built PCC streamliner car introduced to Philadelphia in 1938. Philadelphians called them 'streamliners.' In the transit center area there is a PTC ticket and information booth. 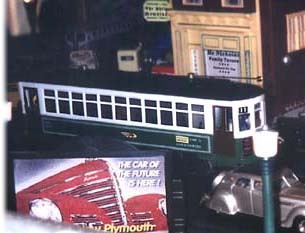 This O-gauge trolley is an MTH model (in PTC colors) equipped with Protosound 2.0 - a feature which allows it to make stops and announcements along the line. Also on the middle level, an EMD Pennsy yard diesel pulls a group of freight cars, including a custom one-off model of a Rohm & Haas tank car. This train takes a sharp downgrade to go below street level and climbs back up on a scratch-built viaduct/trestle painted white/gray concrete. Passersby can wave at the brakeman at the rear of the red PRR caboose. Or at the two bums in the boxcar. New for 2009 is an animated neon Pennsylvania RR sign over the tunnel. The top-level mountain section is HO scale (everything else on the layout is O gauge). A PTC Brill Birney-style wood-sided trolley with trailer operates along a rural line. Of course, there are no mountains in Philadelphia but this train layout is about make-believe and fun, so liberties have been taken. 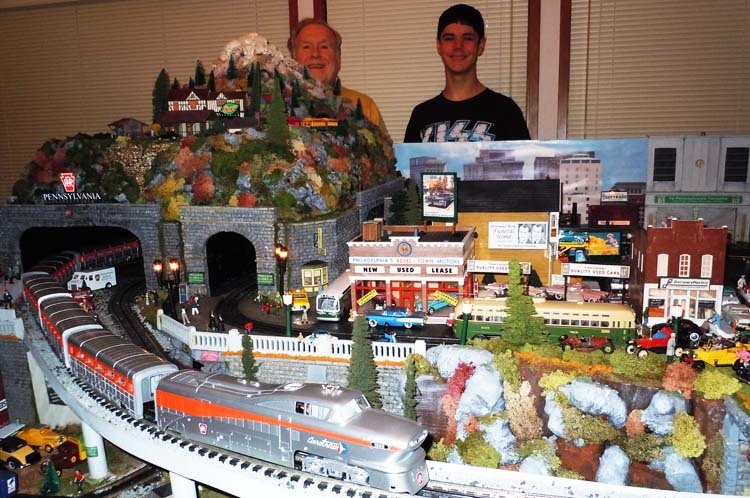 This model railroad is put up once each year from mid-November to late-January. It is stored the remainder of the year.